The Mercer Quality of Living Survey of 2011 awarded joint 3rd place to Auckland, New Zealand – a choice that surprised many Europeans, accustomed to thinking of their own cities as the world’s best, but one that is no shock to anyone who’s actually visited or lived there. But what is it that makes Auckland so liveable and why should you move there? Auckland is located on the North Island of New Zealand on a narrow strip of land surrounded by natural harbours. It is the country’s largest and most populous city – in fact, over 30% of New Zealand’s population live there. The climate is warm (but wet) and perfect for taking advantage of the golden beaches, rolling countryside, native forest and beautiful islands that are all on Auckland’s doorstep. As the country’s largest city, it is home to a significant Maori population, a large community of Pacific islanders, a growing Asian contingent and many of European descent from the UK, Hungary, Holland, Yugoslavia and the far corners of the Continent. New Zealand continues to attract a lot of immigration – in 2005 over 20% of the country’s inhabitants were born overseas, one of the highest proportions in the world. Most of this immigration is from South East Asia and is focused on Auckland due to the economic opportunities it presents and the high standard of living. Despite a relatively low GDP and high national debt levels, the unemployment rate in New Zealand is the 14th lowest among developed nations. This cultural mix makes for a vibrant and cosmopolitan atmosphere that sets Auckland apart from New Zealand’s other major cities such as Wellington and Christchurch. It also makes for the country’s largest urban population, with some 1.5 million residents and growing. Located at the northern tip of North Island, Auckland is New Zealand’s main transport hub – gateway to the Pacific and beyond. Its landscape is unrivalled by many major world cities, a fascinating combination of rippling blue seas and spectacular volcanic cones creating a series of lakes, lagoons and islands backed by lush green scenery courtesy of the rich volcanic soil. Warm, humid summers and mild winters provide plenty of opportunity for enjoying an outdoor lifestyle, be it bathing on the beach, living the high-life in the attractive harbours or exploring the beautiful natural environment that surrounds the city centre. For those with more cosmopolitan tastes, Auckland offers opportunities aplenty for shopping, eating out, entertainment and dancing. Thanks to its broad cultural mix, Auckland offers some of the most diverse dining options in the Pacific, from traditional Maori favourites to fine French cuisine, all washed down with a glass of the famous local wine. 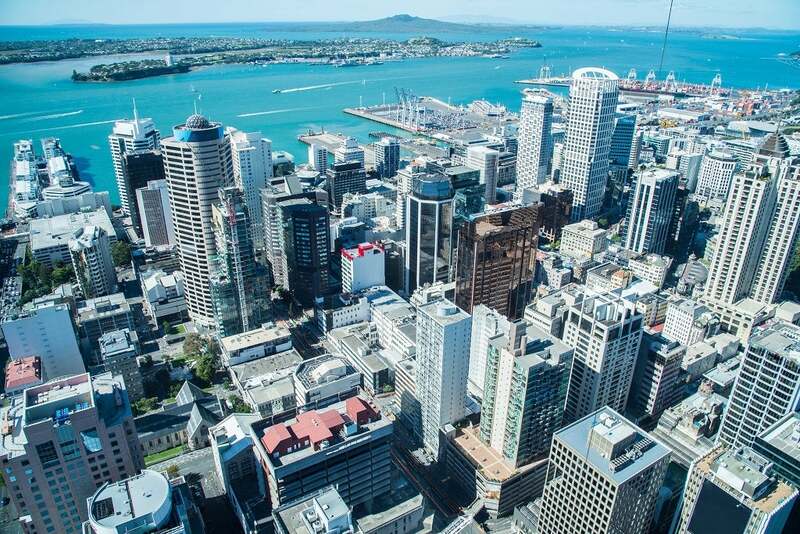 Unemployment levels in Auckland are currently at their lowest for several years and sectors such as the construction, manufacturing and IT industries are positively booming. Opportunities for English-speaking expats are good, making it a popular choice for those looking for a new life down under. Major employers in the city include Air New Zealand, various freight forwarders and other companies associated with the airline industry; a number of healthcare groups such as Abano, New Zealand’s number one healthcare and medical provider; banks and insurers such as ASB and IAG; and Datacom, the country’s largest domestic IT company. Salaries in Auckland tend to be slightly higher than in Wellington and Christchurch, but this is more or less balanced by a higher cost of living, particularly when it comes to property purchase and rental. A graduate structural engineer based in Auckland can expect to earn $52,000, rising to over $144,000 at the most senior level. Salaries in IT start at $50,000 – $55,000 for a junior .NET developer while Java and SQL developers can expect to earn in the region of $95,000. Contractors can anticipate earning between $75 and $90 per hour. Auckland’s tech centre is now home to 53% of New Zealand’s IT employees, giving the more established Wellington tech industry a serious run for its money. Prices in Auckland are similar to the rest of the country, although accommodation costs do tend to be slightly higher. With its relatively low population, New Zealand’s purchasing power is not strong. This is reflected in the price of groceries and clothing, which can come as a surprise to new arrivals who have budgeted according to their current outgoings. Expect to pay around $7 for a dozen eggs, $2 for a litre of milk, $12 for three litres of detergent, over $70 for a dress from a high-street store and in excess of $150 for brand-name trainers. A mid-range dinner for two with wine and dessert will cost around $115, while city bar prices are in the region of $15 for a cocktail or $8 for half a litre of beer. If you are planning to rent a property on your arrival, based on current prices you will need to budget $1,500 for a one-bedroom apartment in the city centre or $1,100 in the suburbs, rising to $2,600 for a three-bedroom city-centre apartment or $2,050 further out. The Auckland property market is one of the strongest in New Zealand. Over the three months to June 2014, average property values were up 12% on the same period the previous year to $718,000 citywide, with average prices in the most affluent North Shore and Central City areas even higher. There are still many affordable pockets however, with median prices in the same period standing at $444,000 in the Papatoetoe area to the south, and $478,000 in the Henderson area to the west. In December 2014 average days to sale were just 29, and high demand from buyers coupled with too few listings to satisfy their needs is further fuelling growth in the sector. Most expats choose to rent when first arriving in their new home country. Doing so will help with budgeting for your first few months in Auckland, as well as giving you a chance to find your feet and decide which area of the city is best for you. If you do choose to buy and require a mortgage, your budget should allow in the region of 6% interest on your loan repayments. Laid out on a volcanic isthmus that is just 2km wide at its narrowest, Greater Auckland is in fact a cluster of four separate cities that are joined together by a network of highways that criss-crosses the myriad harbours, rivers and sandy bays. Each of the four, Manukau, Waitakere, North Shore and Central have their own distinct characteristics as well as offering significant differences between their individual neighbourhoods. Family Friendly: Head to the Eastern Suburbs of Pakuranga, Howick and Panmure for family-friendly accommodation away from the city centre. These delightful neighbourhoods are set in a quiet beachside location, perfect for making the most of your downtime at the end of the working week. Upmarket: If gleaming high-rises, luxury mansions and high-end village boutiques are your cup of tea, Remuera is your destination. Hip & Trendy: Ponsonby is home to some of Auckland’s most happening nightspots, so look no further if you are looking to live right in the heart of the action. Up & Coming: Mount Eden and Epsom are two of Auckland’s most established suburbs but have been overlooked in recent years in favour of central city new builds. Now is the time that they are making their revival. Due to its relatively remote geographical location, most removals to New Zealand are carried out by sea transportation. As the country’s main transport hub, your belongings may reach Auckland slightly quicker than Wellington or Christchurch, though you will still need to allow plenty of time for shipping and customs checks. One of the benefits of shipping to Auckland, however, is that you are likely to incur fewer costs on domestic transportation once your belongings arrive in port. Shipping a full 20-ft container will be closer to $7,800, while a 4-ft around $10,000 demonstrating the economies of scale in transportation. If you are planning to start afresh, 100 cubic feet may be sufficient to take account of your bare essentials and items of sentimental value and will cost around $1,700. The standard of education in New Zealand is exceptionally high, ranking seventh in the world for science and reading and 14th for maths, making it a popular choice for those looking to start a new life abroad. The education system offers a mix of private, partially funded and state-funded schools for children from five to 18. There are over 500 schools in the Greater Auckland region and every child is guaranteed a place at their zoned state school. If you wish to explore the private sector expect to pay anything from $12,000 to $30,000 per year. For higher education, the city offers the University of Auckland and AUT University, plus several Institutes of Technology and Campuses representing universities from elsewhere in the country. According to the Mercer Cost of Living Survey in 2014, Auckland ranked 58th, considerably lower for cost of living (meaning cheaper) than cities such as London, New York, Sydney, Hong Kong and Singapore, which all ranked in the top 30. Consumer prices including rent in Auckland are 34.68% lower than in San Francisco while they are 3.6% higher than in Calgary. Taking rent out of the equation, consumer prices are 2.7% lower than in San Francisco and 9.64% higher than in Calgary. In terms of quality of life, Auckland is up there with the very best. The 2011 Mercer survey placed the city at joint third in the world, making it easy to understand why so many people choose to relocate to this vibrant, multicultural metropolis. With such spectacular scenery to admire, life in Auckland is lived as much as possible in the open air. So what should you do to make the most of your environment on a relaxing weekend day? Begin with a coffee at a pavement café in Ponsonby before heading by ferry to Devonport. Within little more than 10 minutes you will find yourself in a picturesque seaside town where you can dip your toes in the Pacific waters, browse the craft shops and enjoy a leisurely lunch in the harbour before heading back to the hustle and bustle of the city centre. Back in the thick of it, more retail therapy awaits at the famous Smith & Caughey department store, where the opulent Victorian interiors are as eye catching as the merchandise. Dine at the City Works Depot before taking in a performance at the iconic Civic Theatre or a live comedy show in the Queen Street quarter, and finish with a moonlit stroll for a perfect end to a perfect day in Auckland.